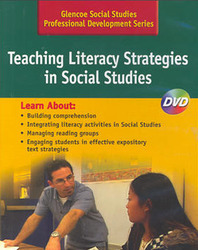 Teaching Literacy Strategies in Social Studies—Learn about building comprehension, integrating literacy activities into a Social Studies lesson, managing reading groups, and engaging students in effective expository text strategies. Participants learn about ways to build literacy skills in social studies. They watch video commentary by teacher educator, Douglas Fisher, who discusses the importance of literacy in the classroom. Participants observe classroom lessons in which teachers use strategies for building literacy.